Volterra is rooted in 3,000 years of history and traces of every historical period can be found within its walls. From the Etruscan period, the Porta all’Arco is crowned by carvings of ancient gods. The enchantingly well-preserved Roman Theatre and Baths are testaments to the city’s wealth under the rule of Augustus. 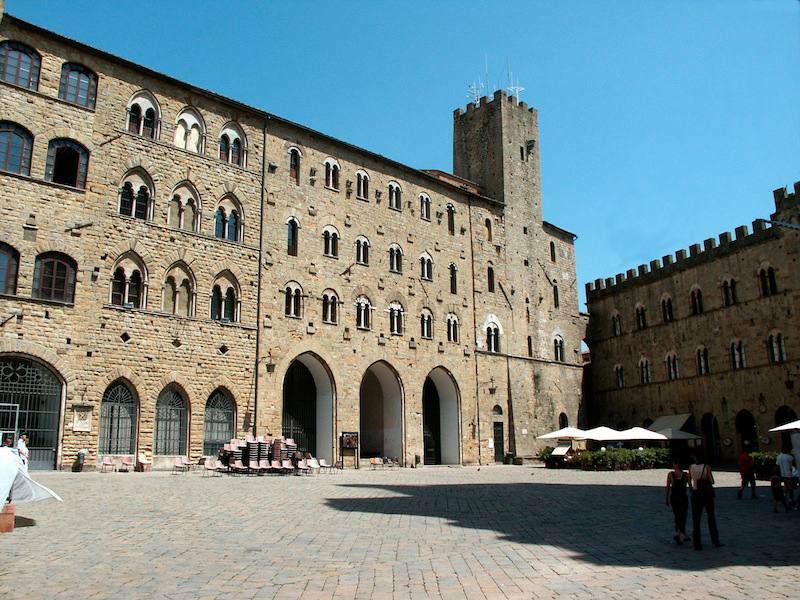 Volterra’s Medieval and Renaissance prosperity left behind the Fortezza Medicea, the Palazzo Incontri-Viti, the impressive city walls, and a maze of narrow streets. Although Volterra is a short distance from Florence, Siena, and San Gimignano, and is part of Tuscany, it is surrounded by countryside that ascribes to a traditional, slower way of life. As a result, the city has not felt the crush of modernity and has retained its Medieval charm. Cruise visitors wandering its majestic palaces and admiring the work of alabaster artisans will also feel Volterra’s unique, timeless atmosphere. The Cathedral, the Baptistery of Saint John and the Church of Saint Francis are religious sites impossible to miss in the historical center. These are highlights of Volterra together with the Museo Etrusco Guarnacci (Etruscan Museum), the Museo Diocesano d’Arte Sacra (Sacred Art Museum), the Palazzo Minucci-Solaini (Pinacoteca and Civic Museum) and the Ecomuseo dell’Alabastro (Alabaster Museum). For the cruise interested in ancient history, the Roman Theatre and the Archeological Park are two major archeological sites that must be visited. Famous for its alabaster, Volterra has quite a few shops where carvings of this white stone can be purchased. Certainly the cruise traveler will not miss the dsiplays all over town with all sorts of decorative objects. And, has the town is easy to explore in a couple of hours, the cruise passenger will also have the opportunity to taste truly Tuscan flavors, be it a light fare on an enoteca (wine bar) or on more upscale and famous restaurants like Il Sacco Fiorentino or Del Duca. IQCruising strongly advises a visit to the Tourist Information Office on Piazza dei Priori (very centrally located) - open every day between 10:00 am and 1:00 pm and between 2:00 pm and 6:00 pm to double check opening hours of main attractions. The Tourist Information Office can provide adtional information of interest for the cruise ship passenger calling at the Port of Livorno. Besides great maps, it also offers an Audio Guide Tour that is ideal to explore Volterra on your own. If the cruise traveler is interested in the popular Twilight vampire saga, the Tourist Information Office has info about all major filming sites and tours on offer. The information on this page was accurate when last updated but changes may have occurred without notice. It is advisable to confirm details with local tourist information before planning your tour of Volterra.